Meet Jim Reid, Mighty MidiTzer Player. Miditzer virtual Style 210 2/16 WurliTzer Theatre Pipe Organ up on the LCD screen. Jim Reid is a member of our Walnut Hill VTPO group at Yahoo!, and has been since the group formed. He is also a member of the Walnut Hill Wall of Fame and holds the office of Research and Development in the Walnut Hill Organ Club.. I am a native of the Central San Joaquin Valley of California, born and raised there. Went to school with all the kids of the families that had left Okalahoma, Arkansas, etc., because of the '30s dust bowl and depression problems. We moved out here to Hawaii in 1991, and have been out here on Kauai for most of the last 14 years. Very nice! We came out here and did a Bed and Breakfast for a few years. 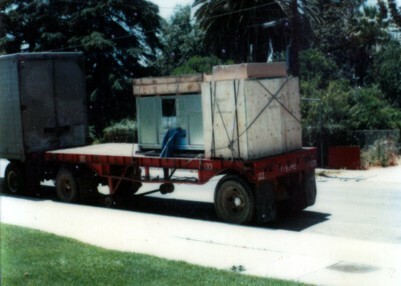 The Allen arrives in California, 1978-79. 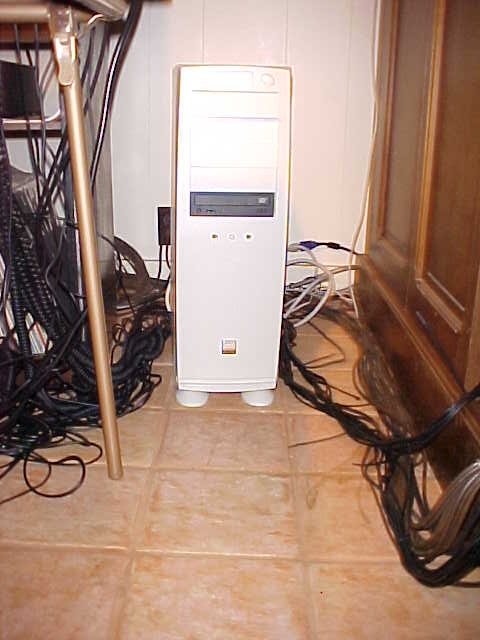 Getting it all connected in our home. The Allen was set up in our home. The dealer invited Tom Hazelton (who at the time was playing at the Pizza and Pipes restaurant in Redwood City, California, and also has a huge church in Menlo Park. He is excellent at both theatre and classic styles! Tom playing for a bunch of our friends and some from the San Jose Chapter of the AGO. There was a full house that evening in June, 1979, 26 years ago now. 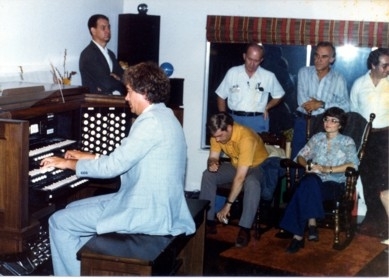 Long ago, I was completely into Bach and all the other "classic" organ music. 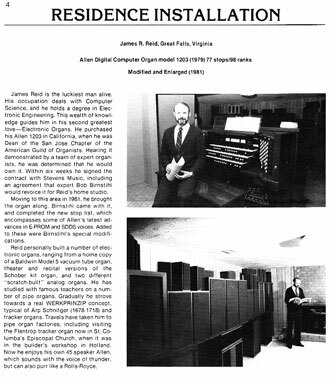 Thought you might be interested in what I looked like back in 1981, my then nearly new Allen set up in the basement of our home at that time in Great Falls, VA. This was done by Jordan Kitts Music of College Park, Maryland, who actually used my installation as a demo to church organ search committees! I have no idea if they ever sold any as a result! Note: the beard dissapeard years ago! Too much trouble to maintain. Tom likes what he is hearing! Here I am, with my back to the camera, practicing away. A veiw of the nice big notes of Frankie and Johnny for easy reading by my old eyes! 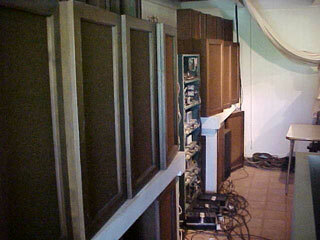 The amplifier racks which feed out bi-amp's signals of four of the organ audio channels. Amplifier racks which feed out bi-amp's signals of four of the organ audio channels; four more amps for the so called "main channels" of the Allen; four more amps for the Lexicon MPS 110 signals to their speakers. 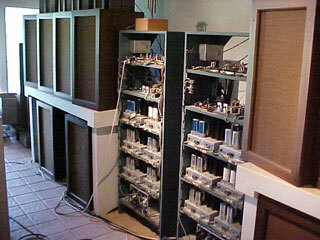 The amps on the bottom shelf of each rack are Allen's newer dual 100 watt amps. All the others are their S-100 amplifiers. The "wall of speakers", looking toward the South wall of our "great room". You can just barely glimpse the Zimbelstern atop one of these racks. Looking the other way to the far North end of the speaker array. In this one you can see the curtain drawn open and pulled back out of the way. Usually this entire wall of "stuff" is hidden from view of folks in the room by this 27+ foot long curtain. 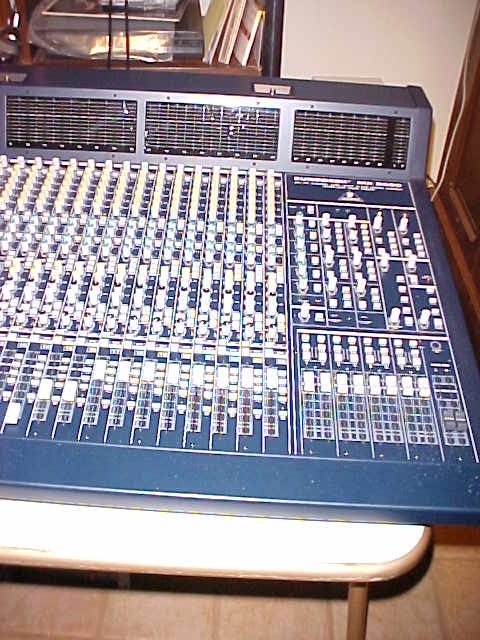 The inside of the Allen console as it came in 1979. 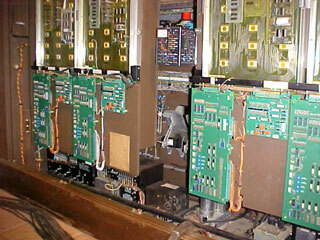 This photo shows the inside of the Allen console as it came in 1979. Note the blank areas below each of the MOS boards. To those areas will be attached the ALJ Electronics midi output boards. 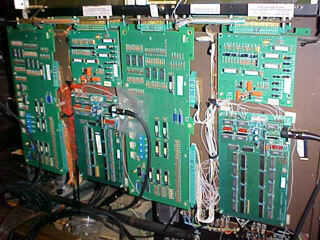 The inside of the Allen console with two of the four ALJ boards installed. 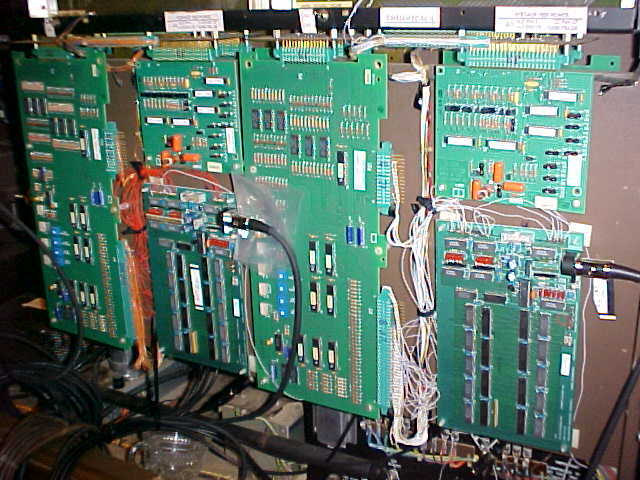 This photo shows two of the four ALJ boards installed, one beside each of the four Allen Keyboard Array cards; one of these for each of the manuals and pedal board keys. 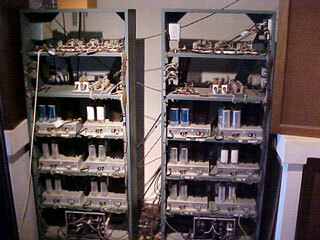 Note the midi cables leaving each card. 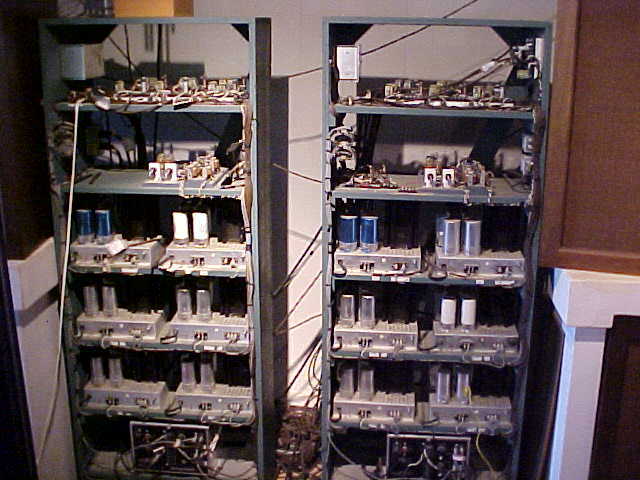 These go to a midi "summing" box which outputs the combined midi channels to the dedicated PC. 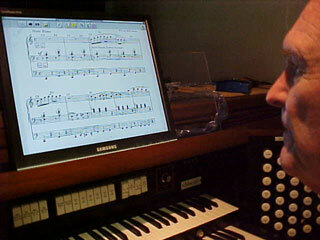 The organ dedicated PC, running Miditzer and Hauptwerk. 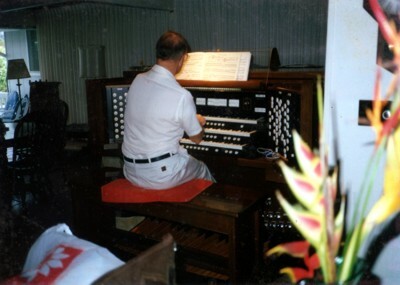 The organ dedicated PC, running Miditzer and Hauptwerk. The PC is currently loaded with 8GB of RAM. 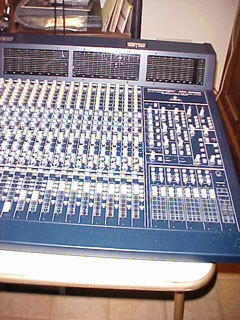 This is the Behringer mixer board, which allows me to sum the two PC output channels into any or all at various mix levels of the Allen eight channel audio system of amps and speakers. Jim loves the Theatre Pipe Organ and the music it makes. We are honored to present this page dedicated to Jim and his Mighty MidiTzer renditions. Below are five selections from Jim playing the Mighty MidiTzer, a virtual Style 216 2/10 WurliTzer Theatre Pipe Organ. Following this list of music are some comments from this wonderful player of the VTPO who now lives in the sunny Island State of Hiwaii. Playing time: 1:47, file size: 1.62MB, bit rate: 128KB/sec. Playing time: 3:04 file size: 2.88MB, bit rate: 128KB/sec. Playing time: 1:38, file size: 1.54MB, bit rate: 128KB/sec. Playing time: 2:56, file size: 2.75MB, bit rate: 128KB/sec. Playing time: 3:48, file size: 3.56MB, bit rate: 128KB/sec. Jim's Comments About His Selections. The first piece is titled The Sunshine of Paradise Alley. Sunshine was written and published in 1895. The music was written by John W. Bratton. There were also words written by Walter Ford, but I can find no copy of them. The publisher that year was M. Witmark and Sons. The piece became the #1 single for the New York Times list on April 1st, 1889! Whatever the words were about, they inspired a silent movie made in 1926. In 1905, the music had earned the designation as being a "good old fashioned waltz". Bill Irwin wrote this arrangement for the TPO way back. Unfortunately, the copy he sent me does not have the date of copyright upon it. This was one of the first pieces he assigned to me to learn in the Fall of 2003. He was very upset with my first attempt to play it: I had not counted out accurately the note values! And he insists on precise detail.....so I learned that lesson right away! So here is my on-going attempt to play The Sunshine of Paradise Alley. Irwin marks that it is to be played "Slowly and Smoothly". He loves harmony, so you will hear a lot of interesting harmony in this piece. For example, he uses ten "ninth" chords in a very nice sequence in the five measures just before the last two measures of this slow waltz. I hope he believes I have done it justice. However, I am an absolute novice at registering the MidiTzer, so forgive mr if you feel it obviously should be done in a different way! Irwin had used Sunshine during his workshop at the ATOS Convention last year (2004) in Milwaukee. In the September/October, 2004, issue of Theatre Organ (The Journal of the American Theatre Organ Society), Bill Irwin has presented the complete score of The Sunshine of Paradise Alley, pages 14 and 15. He also gives a complete description of the chordal layout of the piece beginning on page 13, completing the topic on page 16 along with excellent explanations about why he has arranged to piece as he did. 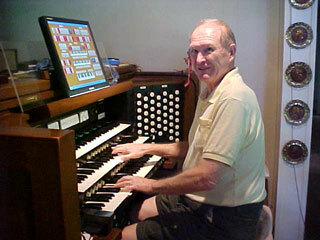 Irwin titles his piece in this Journal issue, "Theatre Organ Style...What is It? ", and he explains his understanding about "our" style before launching into the description of Sunshine. The score is given exactly as I played it. However, I am not sure I used the exact tempo he had in mind, nor if I play it "smoothly" enough. But, it is the very first "theatre style" piece I learned! "Paradise Alley is the ironic nickname for a rundown tenement district in the Lower East Side. Despite their shabby surroundings, everyone in Paradise Alley is blissfully happy, thanks to the goodwill spread by heroine Barbara Bedford, the "sunshine" of the title. When banker Gayne Whitman proposes to tear down the Alley to erect a factory, Bedford tries to prevent this tragedy. Despite the interference of villainous Nigel Barrie, the heroine succeeds with the help of clean-limbed hero Kenneth McDonald. Jewish comedian Max Davidson provides his usual ethnic buffoonery as a soft-hearted merchant." And now for the second number. Goody Goody was written and copyright in 1935 by Johnny Mercer and Matt Malneck. Copyright owner is DeSylva, Brown and Henderson and was renewed in 1963 by Commander Publishications and Malneck Music. Irwin's intent in assigning this piece was really to see IF I could learn and play it --- he didn't sound too sure. He commented, "Well, if you can't play it, you can't play it." So I went to work on same, for several months. The result is here for you to judge. No, I could not play it as fast as others can, but I believe it is pleasing even at my tempo. I am not sure you can play it as fast on the TPO as on a synthesizer.....oh well. And I hope you're satisfied you rascal you!" Irwin's version uses both the above verses. His copyright is 1967 by both Commander Publications and Malneck Music. I was pooped by the end, so I omit the repeat in this recording. The Irwin arrangement is full of interesting harmonies; maybe I dwell too much on some of the lovely chords! He uses a lot of "walking" pedal notes -- heel, toe stuff. If I keep at it for awhile, I might be able to speed it on up to 80 to 90 beats per minute. My present pace is probably about 70. This is real "rub your tummy, pat your head, and do something else along with it" style music!! I worked on this for a few months to please him; well, sort of! Again, everything must be exactly correct, or back for more practice. Irwin's arrangement is copyright 1962 by Keyboard Publications. He labels it to be a "Slow Blues" piece with an interesting Blues Chorus solo using a Clarinet style voice on the Solo manual. I have registered Miditzer exactly as he specifies, well almost, I added a bit to the Clarinet of Miditzer as it seems a bit "weak" against the Accompaniment manual. I just might have made it sound more like a muted trumpet, or some such, but it stands out! Note, this is done via a synthesizer, but illustrates a tempo a bit faster than my rendition! 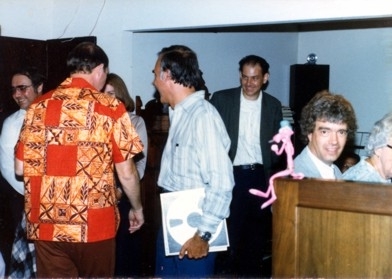 You will note it is not as colorful nor as interesting as Irwin's arrangement, at least in my opinion. I had to click on the indicated spot to hear the piece at this site. The many verses of words are also there. Here is the fourth song, No Not Much. It was the second theatre style piece I learned. 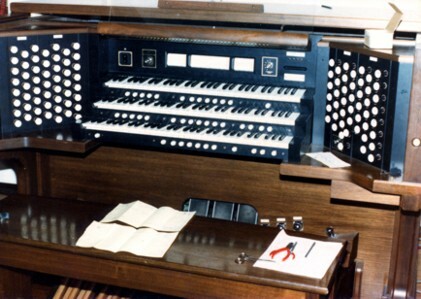 Were I entering the ATOS Electronic Organ ompetition, No Not Much would have been my "Up-console" piece; it is up-tempo, a style required in the competition. No Not Much is copyright 1956, and was recorded that year by The Four Lads. Words and music are by Al Stillamn (words) and Robert Allen (music). The 1956 copyright is by Beaver Music Publishing Corp.
Oh but would I like it, no not much." However, Irwin as usual, introduces richer harmonies. For example, in the "fake" book setting above, the opening chord is a simple G major. But Irwin uses an E-flat chord, with the G note of the melody in the right hand. The arrangement linked above opens the third line, at the words "I don't need you...." with a G-seven chord; again Irwin goes to the B-flat minor seventh! Bill is a lover of rich harmony, he says in his ATOS Journal piece mentioned in the Sunshine article that his goal is to teach how to "embellish otherwise dull arrangements". You might notice at the end of No Not Much, as I play his arrangement, that he ends the piece, not with the simple G-major chord as above, but with a very nice palm glissando (I only wish I could play the glissando more cleanly!). Here is my very early attempt at a new piece entitled When Fools Rush In by Rube Bloom, copyright in 1940 by Bregman, Vance and Conn, Inc. Copyright was renewed in 1968 by John H. Mercer, and this arrangement by Bill Irwin was again copyright by John H. Mercer in 1969. I have found it to be much trickier to play than it sounds, with some interesting finger substition going on. Even Bill Irwin has not heard me play this yet, but he soon will, as I am going to send off a cassette to him. I am not even sure if you should be posting it yet or just wait a couple more months after I have worked on the corrections Bill is certain to request!